Learn how Enterprise Performance Management (EPM) is the seamless integration of many managerial methods including strategy execution (balanced scorecard); product, channel, and customer profitability reporting. Understand how EPM includes financial planning and analysis (FP&A) using capacity-sensitive driver-based rolling financial forecasts. These are imperatives that any organization can use to excel, yet remain viable and competitive. 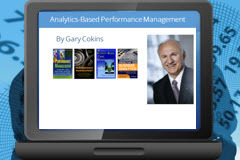 2 What is Performance Management? 4 What pressures that have caused interest in EPM?